Warranty: 3 years on parts, 2 years on labour; 5 years on parts and 2 years on labour for the compressor. Life’s heaps good when stuff just fits. Manitowoc gets that, so they made a 55.9cm (22in) wide ice machine head that fits perfectly on narrow profile storage bins, without the need for an adapter. Coolio, huh? 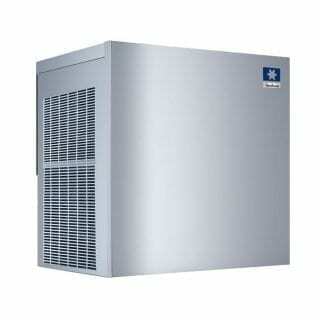 The Manitowoc RFS-0300A delivers up to 174kg of flake ice per day, the type of ice that’s ideal for fresh food presentation and storage thanks to its 73% ice to water ratio. These same small hard bits of ice are also an awesome ingredient for frozen drinks and desserts. The ice maker’s structure in heavy steel, coupled with design improvements that simplify installation and cleaning, make for a nimble, yet resistant piece of equipment built to last. Happy days! If you’re keen to trade up, the Manitowoc RFS-0650A offers a 75% higher daily ice production in the same compact size of the RFS-0300A.